On Sunday 3rd May at about 8.30am I arrived at the car park at Croft Castle. It was empty which was a good sign as I thought I might then have the chance to be up on the hill by myself. It is the Bank Holiday weekend and there will soon be many people visiting the castle and the hill. I walk up to the top of the woods and take off my walking boots and socks. The long dew-covered grass which I first walk though is freezing cold but on the main path the shorter grass and dry earth is much more comfortable. 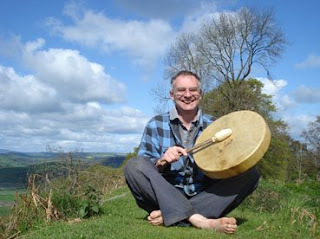 I have my drum with me and I begin a meditation walk that takes me up to the hillfort, around the main rampart and up onto the top of the hill. It is cool, but the sunshine is bright and clear between the clouds. It is an amazing morning. The light is so clear and the colours are beautiful. I look carefully at the views, trees and the landscape around me as I walk slowly and steadily, carried by the gentle beating of the drum. The drum performs superbly in the warming sunshine. Its sound seems to resonate with the wood of the trees. I watch a buzzard in the distance and try and work out how to mirror its flight with my drum. This is a wonderful place to be and, as I complete my playing and meditation, the first of other walkers start appearing on the footpaths around the hill. I set my camera up on a sock and walking boot and take some pictures of myself with my drum. I wonder when the last time a drum was heard in this landscape. I am sure it would have been common in Iron Age times, but who else has drummed up here? It is a superb location to listen, to watch, to observe and to meditate. The views from the hill are magnificent and, on a bright spring morning like today when the leaves are coming out and the landscape is in full spring awakening, they are probably at their best.